It has been a while since my having a house helper. Doing the house chores alone eats up most of my time during the day. At first, it was real chaos, just merely thinking of the things that needed to be done for the day made me feel tired and exhausted already. The setting up of a house chores work plan, and scheduling activities on a time table allowed me time to work on my online tasks. Aside from my work plan I also maximized the use of electronic aids and gadgets like an electric air pot to provide us instant hot water for coffee in the morning, the use of a microwave for cooking and reheating leftover foods, the washing machine to launder clothes and more. I also taught my two boys to do easy chores such as making up their own beds upon waking up in the morning and assigned them other duties like setting up the table, washing the dishes and during weekends sweeping the backyard and cleaning up the windows. When it comes to cleaning, I keep on exploring for tools which could simplify and make my cleaning routine fast yet spotless. 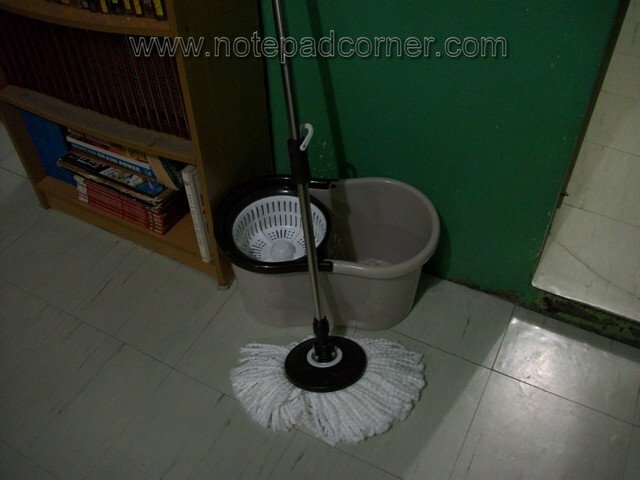 I use the traditional mop when I do floor mopping until two weeks ago when I did my grocery shopping I found this Tornado Mop 360°. 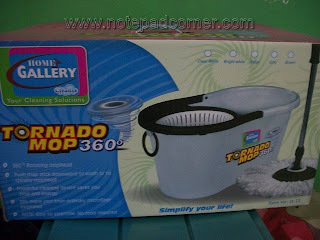 Mopping the floor is now easier for I do not have to squeeze hard the mop head to take off excess water. It’s mop plate design was engineered to be 360 rotatable to reach any corner. A very convenient way to clean hard to reach areas. 6. 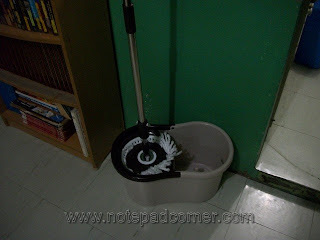 To wash the mop head, put the mop stick on the washing mechanism found at the bottom of the pail. Push the stick downwards to begin washing. And because the mop head has 30% more yarn than ordinary microfiber mophead, it ensures a dirt-free floor. It is really a powerful cleaning device that saves time and energy. I bought extra mop head replacements for future use. Regular price is at Php1499.75. Great savings isn’t it? I have like this for almost 1 year.but now cleaning mop was not working to spin dry.ok Thank's pls reply what will i do. overtime some of the parts of the mop malfunctions, you may ask the vendor where you bought the mop for possible remedies. Depending on usage, in my case I usually buy a replacement mop on a yearly basis.